A writer’s journey is full of milestones. The first draft of a first novel. The first rejection. The one-hundredth rejection. The first publication. These events are shared in common with everyone who has attempted to produce words that others may want to read. Like getting a driver’s license or graduating from high school, they not only function as necessary steps on the way to maturity, mastery, and fame, but also as symbols of all the work it takes to hone your craft and produce quality writing. I ended up in the second-to-last row of seats on my flight to Tampa, and before the engine noise made talking impossible, I overheard the three women chatting in the row behind me. Two of them were writers heading to the Association of Writers and Writing Programs conference (AWP) like me, and the third passenger, sitting in the middle, had no idea what she had gotten herself into. At one point this non-writer asked, “So, what are you each working on?” One of the authors commenced describing her collection of environmental poetry, after which the other detailed her memoir about growing up on a farm. During a lull I glanced backwards to make some funny (dumb) comment about writers, and in doing so, my awkwardness completed our version of the AWP writer stereotype, because this exact scene was simultaneously occurring on hundreds of planes bound for central Florida. We even looked the part—me in an ironic t-shirt, the environmental poet in wild bright colors and tattoos, and the rural memoirist in full librarian garb, with thick glasses and sensible shoes. The Association of Writers and Writing Programs conference (AWP) is an annual event that attracts about 12,000 writers and publishers, and it is a fascinating and draining endeavor that supports the community of writers across the country, offers sometimes-elusive rewards, and, at the very least, adds an impressive number of steps to attendees’ pedometers. AWP hosts its conference in a different city each year, so traveling there becomes a mini-vacation, with meals out, parties and readings every evening, and the enjoyment that comes from spending several days with people who share common interests. There are several types of writing excursions, and each offers different advantages for a writer’s travel time and dollars. AWP is not workshop-focused, like traditional writing retreats and residencies. AWP also differs from smaller, regional writing conferences (like Madison’s Writers’ Institute, for example) in that its size does not allow for an emphasis on connecting individuals with agents and editors. Plenty of literary journal and small press editors are present at AWP, but it’s more of a free-for-all. A giant room (the Bookfair) hosts hundreds of publications and writing programs, each at their own table, where writers can network and make connections. AWP also offers hundreds of presentations from writers, editors, agents, and other industry professionals, each of which is attended by dozens to hundreds of hopeful wordsmiths. AWP is enormous and unwieldy and it’s where most of the literary publishing industry gathers to examine itself. Walking around the Bookfair, I saw what I observed on the plane, times ten-thousand: every writer stereotype imaginable trying to awkwardly talk to each other, hoping each contact will spark a relationship that produces some future writing or publishing opportunity. Some hate these types of interactions, others relish in them, and everyone goes home hopeful about some connections and disappointed in others. Everyone also goes home with a large (and heavy) stack of books procured from the Bookfair. Sometimes it’s hard to judge our progress towards our goals. Most high school graduates wake up the day after graduation not feeling any different, but that’s the nature of rites of passage. 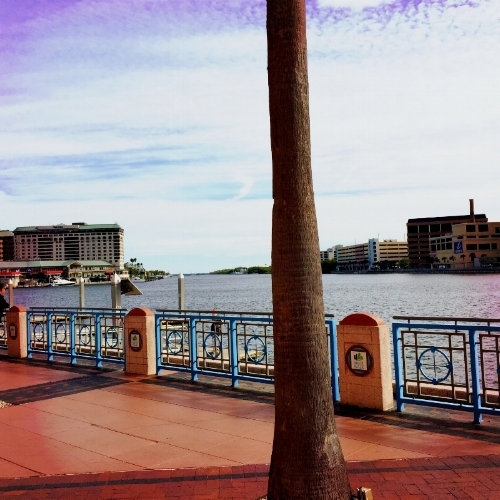 On Saturday, before departing for the airport to head home, I had lunch in a quiet café in downtown Tampa and tried to reflect on my first AWP. I met lots of people, and connected with many friends. I spent three days thinking of nothing but my writing. 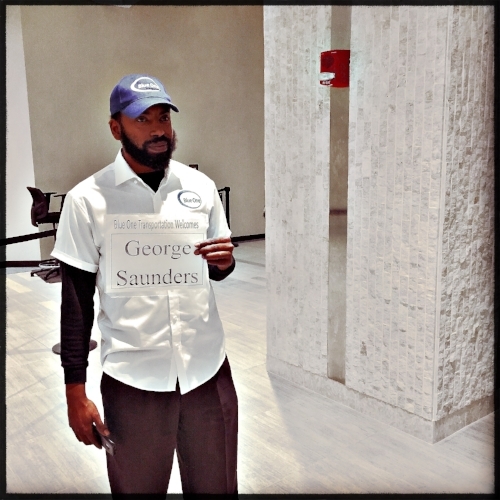 I saw George Saunders’ driver waiting for him at the airport, and I visited Tampa’s aquarium. If the airline fees and personal days didn’t yield any measurable outcomes, they definitely produced some great memories and the fact that I am now the level of writer who has been to AWP. Next year’s conference is in Portland. Maybe I’ll see you there? Click here to read more of Eric's work!